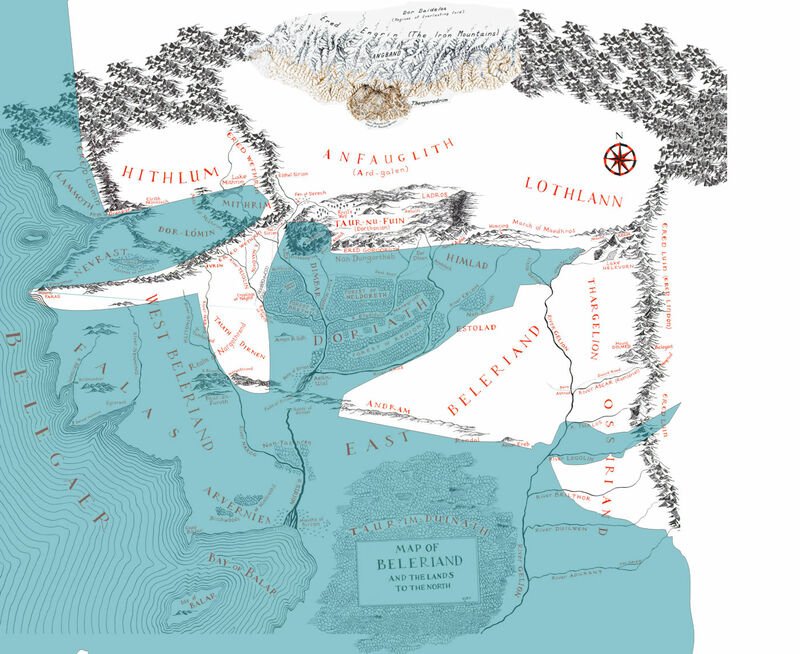 I had difficulty visualising how I thought the Downfall of Beleriand might have happened, so I borrowed some maps and mangled them horribly to show the progress of events and particularly the change in the coast. 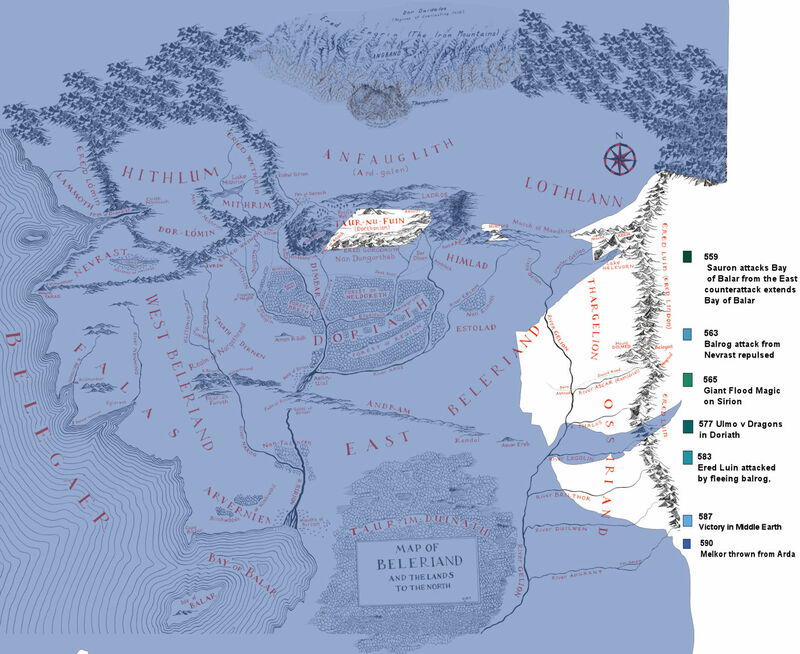 545 : the Host of the Valar arrive in Middle Earth. 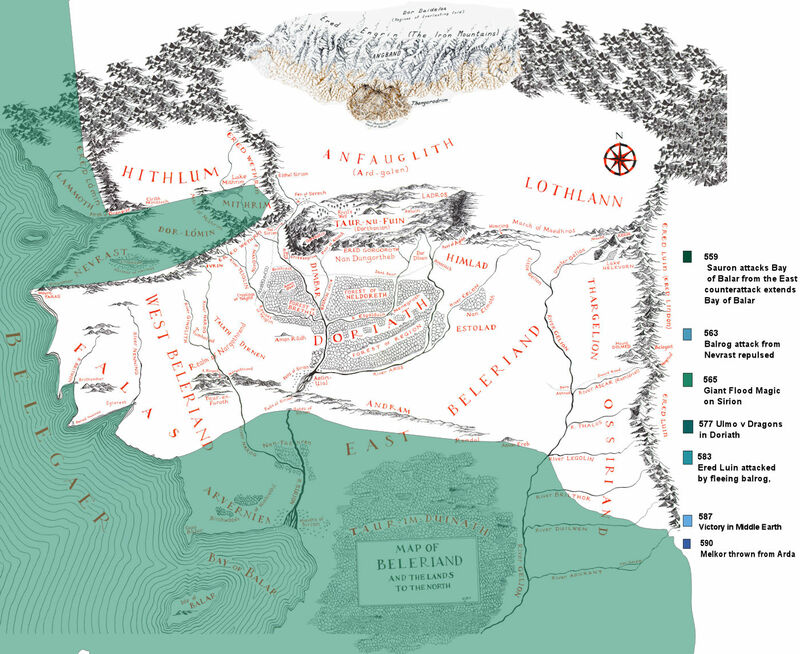 Noldor land at Mouths of Sirion, Vanyar land at Eglarest. 590 : Melkor thrust through the Doors of Night into the Everlasting Darkness, Angband area collapses. ... and it's always weird when that happens on a post with no comments. Like the internet is standing there giving you a Look. I did look at your maps earlier! So I'm assuming that a lot of the land was magically sunk, that the sinking was done in a number of battles, rather than all at once (because the war took 43 years, but quite a few people did survive it) and that places where there are big mountains before might now be fathoms deep. I suppose I could have put the maps up locked to just me : I wanted to shove them all into a post because it's a handy way of having them all on one big scrollable page where I can quickly find them on any machine. Still, if you liked them, maybe leaving them public was the thing! I wonder what had happenned to the Isle of Balar. I had a feeling somehow, that all fleeing elves were huddling there, taking this last refuge, while Eonwe and his army were dealing with Morgoth; but now that I think of it, I can't remember where did I get this suggestion from. Probably imagined. 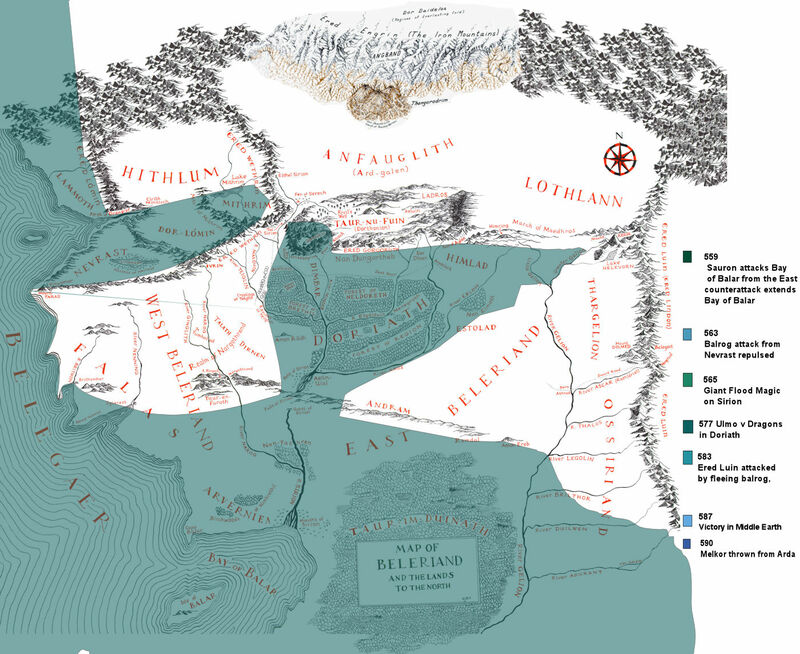 So, in your universe it goes down quickly with all the south of Beleriand. Is it made up or based on anything from the canon? But aha! You have very usefully pointed out a mistake in my maps in that I had shown Balar vanishing right at the beginning, which I had not intended to do. My madeup timeline had it being evacuated back to the Falas, and then later from the Falas to Thargelion / Lindon. I'll fix that. It's really confusing all this land-sinking stuff. I was trying to write about it, and kept forgetting which bits were still above water, hence the maps. We do know that Elrond was at the breaking of Thangorodrim, because he says so in LoTR. He would only be 56 then, so very young in Elf terms, and I'm assuming that if he was there, then so was Elros and probably also Cirdan, Galadriel, Celeborn and Gil-galad. The remnants of the Edain fought in the war too, because that's why they were awarded Numenor as a prize. 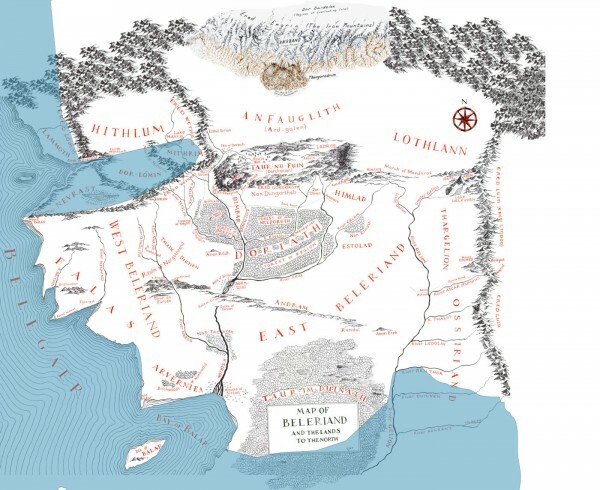 So I think that the people left on Balar would be children, people looking after them, and probably old men and women (the Edain are on Balar as well at the start of the war). Plus, presumably, Cirdan's ship maintenance crew people. 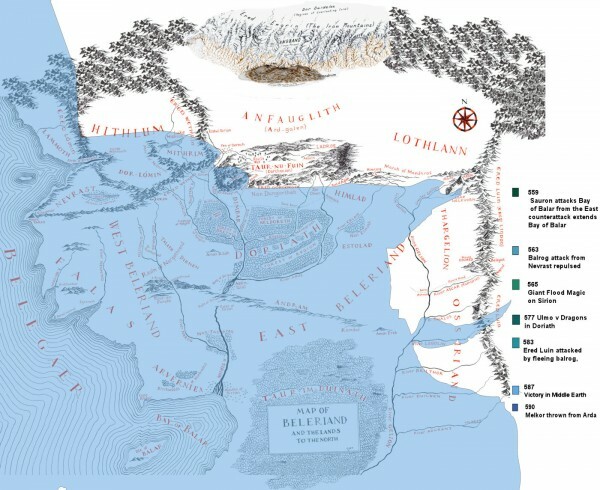 The Silmarillion does give the distinct impression that the Valar stormed ashore and it was all over in about two weeks, but what later description there is actually suggests that most of the fighting was done by the Vanyar and Noldor rather than the Valar in person - presumably because if the Valar had fought in person, Beleriand would have been wrecked much faster and everyone in it would have died. ...I'm inclined to say that Maedhros and Maglor were also at the fall of Thangorodrim, on the grounds that you'd think they would have been there if at all possible, and what else would they be doing...? I wonder... Lots to imagine, nothing in canon to be sure of. I've seen some wise (or at least with a better memory) people discussing that, according to Tolkien, Elrond+Elros were at Thangorodrim, Edain were at Thangorodrim... nothing is said about any beleriandic elves. 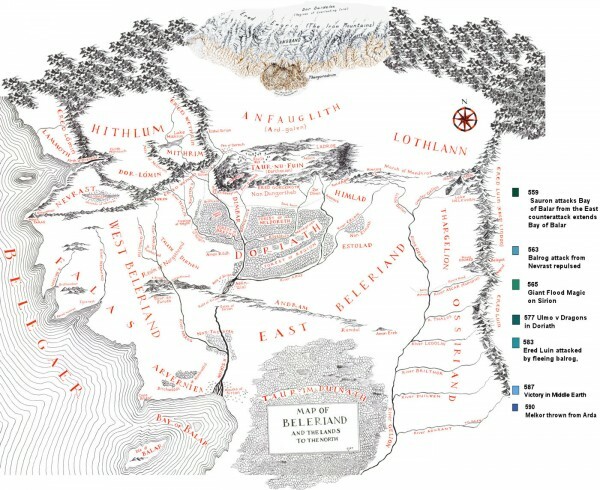 About the Valar - alas, I don't remember where I did get it, but I definitely have read somewhere in the HOME that there were NO Valar in "the host of Valar". "The host of Valar" itself was an invention of Christopher, because he was combining several textes, most of them were old and had "the host of Fionwe", but Fionwe son of Manwe was no more, and he was unsure if he can just simply replace it with Eonwe or no, and at last just has written "the host of Valar" and left it at that. As a result we have "the host of Valar" where there were no Valar at all, and nobody knows what exactly was the role of Eonwe. That's how Christopher Tolkien explaned it himself. 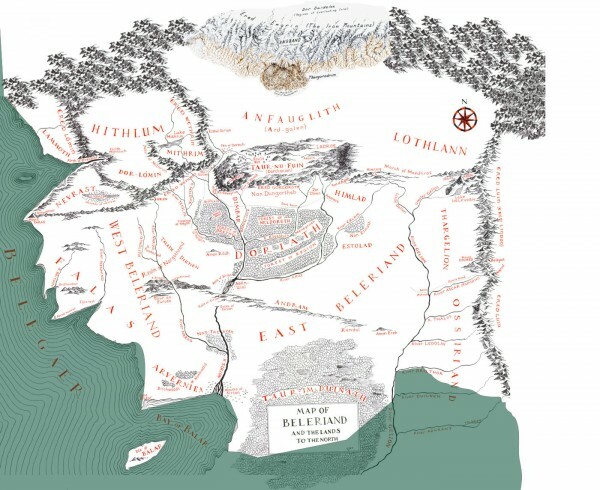 And JRR Tolkien somewhere says that Valar couldn't go to war because, as you've said, Beleriand (and lots of other lands) would have sunk very quickly. Yes, I've seen that: no Valar in the Host of the Valar! I did not know that Christopher created the phrase though. Hurray for Christopher, heroically devoting his life to trying to force his father's muddled notes to make sense. But from a story-telling point of view I need to explain the general impression you get from the Silmarillion, too. Otherwise the story would make sense only to people who have read HoME and can remember it all (which is not me!). So I am going to have Ulmo involved a bit. After all, Ulmo is involved all along. Ulmo does what he wants :-D.
I'm trying to stay closer to the Silmarillion, and use HoME only for background. So no burned Amrod, and Gil-galad as Fingon's son, which may be a Christopher mistake but I think makes way more sense than the more complicated family tree with Orodreth. "Ulmo is involved all along. Ulmo does what he wants :-D." - Yeah, lol, Tolkien himself sometimes thought so! Yes! On a first reading it sounds like the War of Wrath was over in no time but fortysomething years make more sense if people in Beleriand are supposed to have time to run away! M&M near Thangorodrim: is there any reference in HoMe to where Eonwe's camp is? Not very far, I suppose and they must have been lurking nearby to be able to attack it. ...Eonwe's camp, I don't think so, no. There's very little detail given at all. But we do know that they had to deal with all the thralls that came climbing out of Thangorodrim, and I *think* there is a mention somewhere that they had to build ships - the Teleri dropped them off, but refused to land, so I don't think they can have stayed on Anfauglith very long - it would be unstable and no water. (My version of the War of Wrath, Eonwe's camp is in Lindon because Beleriand is falling into the sea, and Lindon is still stable and has clean water etc for emergency first-aid and supplies. But I'm struggling to remember exactly the canon I made notes about now, because I've written my own much more detailed version and now I can't remember which bits I made up to fill in the holes. Now feeling guilty for not keeping more careful notes.